The Sugar Skull is a popular choice for a tattoo and is a design chosen for many different reasons. Traditionally, Sugar Skulls were created to honor our lost loved ones but also representation of anyone that has passed away. This is only a small snippet of the history around Sugar Skulls, and our way of acknowledging ‘The Day of The Dead’ and ‘Halloween’ and the diversity of the Sugar Skull Tattoo. However choosing to have a Tattoo and a particular design should continue to be as individual and as personal as the Sugar Skull itself. The Sugar Skull is one of the more recognizable figures or images that is seen during the Dia de los Muertos (Day of the Dead) festivities in Central and Southern Mexico. With festivities lasting for a couple of days, starting, allegedly, with the gates of heaven opening at midnight on 31st October to enable the spirits of children to be reunited with their families for 24 hours. On the 2nd November adult spirits will then come down to join in with the festivities. The smaller sugar skulls placed on the ofrenda (alter) are to represent deceased children whilst the larger, and more ornate skulls that replace them represent lost adults. These dates coincide with recognizable dates within our own calendar, Halloween, All Saints and All Souls Day. The Sugar Skull is used to decorate the ofrendas (alter) on Dia de los Muertos (Day of the Dead), and was traditionally made from molded sugar. The skulls will often have the persons name written on the forehead and will also be placed either at the home or on the gravestone to encourage the return of that individual spirit. Believing that death is not the finality; but a move to a higher level of conscience; as a happier spirit is more likely to provide protection, good luck and wisdom to their families. The history of Sugar Art can be traced back to the Italian missionaries of the 17th century, where sugar lambs and angels were made to celebrate Easter, with Sugar Skulls being used for festivals by the 18th century. The design of the Sugar Skull reflects the art style of the region and will depict the skulls smiling, they are adorned with sparkly ornaments, feathers and are decorated with swirls and dots of icing to enhancing the skulls features. The designs are brightly coloured, fanciful and highly ornate. Symbolism of a sugar skull is focused in the decoration around the eyes. Flowers to symbolize life and cobwebs death. Burning candles inside the eyes are used as a sign of remembrance. Tattooists have enjoyed using sugar skull for their artistic creativity for many years, making it a long-standing and popular choice for a tattoo design. The marigold known as the “flower of the dead’ is the most common flower used for a more traditional sugar skull tattoo design. Sugar skull tattoo designs are usually very colorful, just as they are in real life, and any colour combinations can be used. Sugar skull tattoo designs are typically more of an animated shaped skull, but there are also plenty of designs where a realistic skull is used. It is said that women tend to choose the stylized shaped sugar skull tattoo while men seem to be more partial to the more realistic approach. The eyes of the sugar skull tattoo designs may depict the eyes as flowers, hearts, candles, or diamonds and other precious stones. Sugar skull tattoo designs, as with real sugar skulls will often include a multitude of related symbols such as stars, birds, flowers, hearts, vines etc. Many of which are chosen are significant to the person. The Wolf is used as a representative of deep faith, and profound understanding. Wolves have been around for thousands of years demonstrating their ability to survive in harsh locations, often represented as a solitary animal. The wolf is a very social animal living and hunting in packs and their family groups and choosing a mate for life, all of which has probably played a role their continued survival. The Wolf has been linked with a range of different cultures, but probably most commonly with the Native American Indians, with the wolf being a Totem animal. Totem animals are spiritual animals sent to guide through life. Totem wolf symbols belong to tribes who truly understand the depth of passion that belong to this noble creature. The wolf totem represents allegiance and determination with shape-shifting abilities enabling them to change into a man if someone was in trouble. Christians used them as a symbol of evil; the wolf represented Satan in opposition to the lamb, which is the symbol of Jesus. This probably explains the wolf’s dark role within children’s fairy tales. Whereas a she-wolf was crucial to the survival of Romulus and Remus in Roman mythology. The wolf is a lucky omen in Mongolia, especially for men believing that they were once descended from a mating wolf and a doe. Norse mythology Fenrir or the ‘fame-wolf’ was the father of wolves Skoll and Hati who is said to have brought down the house of he Viking Gods Asgard causing an apocalypse by swallowing the sun. So it is no wonder that the wolf is seen as a powerful creature with great powers. Throughout history Wolves have been portrayed as both good and evil; and as it has been portrayed in life the wolf tattoo seems to have just as many positive and negative connotations. However the fact that they are pack animals, that they mate with the same partner and are good parents the most common representations for the wolf are around loyalty, family and love. A wolf howling in front of a full moon is a popular imagery for a wolf tattoo, with legends having associated the wolf changing into something evil when the moon is full. Most commonly shape-shifting into the terrifying werewolf with its melancholy howls echoing through the gloom being said to represent death and the mysteries that wait within the darkness. A tattoo of a wolf is more likely to be chosen by men. Native American men having the wolf to represent not only their masculinity, spirituality, discipline but also their loyalty. And was often the preferred choice of a shaman. 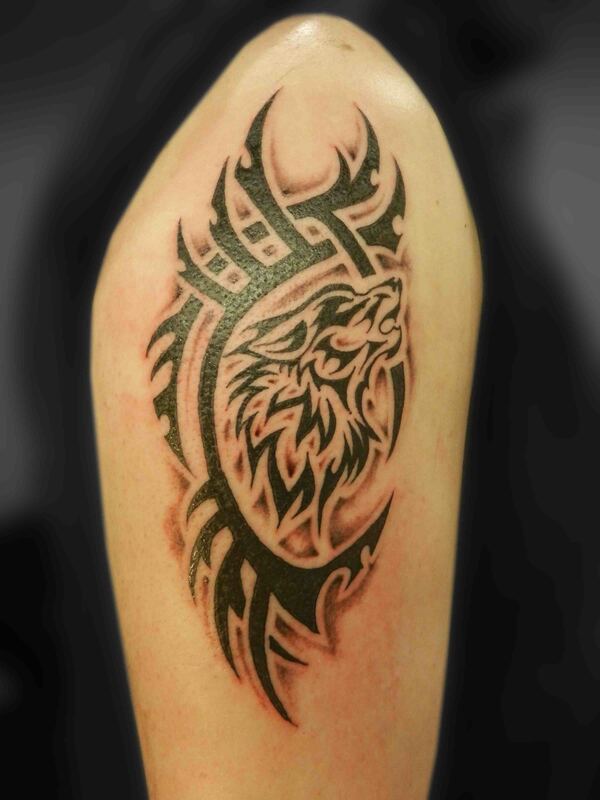 The “ lone wolf” is a younger male who left the pack to find its own territory and mate, so a wolf tattoo can represent a young man trying to find his own way in life. A she-wolf brought up the founders of ancient Rome, Remus and Romulus, which is said to signify the wolf’s compassion and warmth, but also giving a connection between wolf and woman. So a wolf tattoo for a woman is said to represent a wild inner nature, a desire to shed the obligatory restraints of culture and at the same time showing a struggle to get in touch with her natural nature. In our studio in Truro Cornwall we know that the Butterfly is one of the more popular tattoo choices; especially for women probably because of it’s natural beauty and variety; but rather than being considered a tattoo cliché the butterfly should actually be recognised for its symbolic meaning not only from within our own culture but from around the world. People throughout the ages have felt a spiritual connection with butterflies, with ancient people believing that the butterfly was in fact the human soul. Within the Christian faith the butterfly was said to represent the soul having escaped the limits of the body, similar to that of the amazing metamorphosis of the butterfly. Woman who choose to have a butterfly tattoo are said to be a “free spirit”, who are as unique as the patterns on the wings of the butterflies. 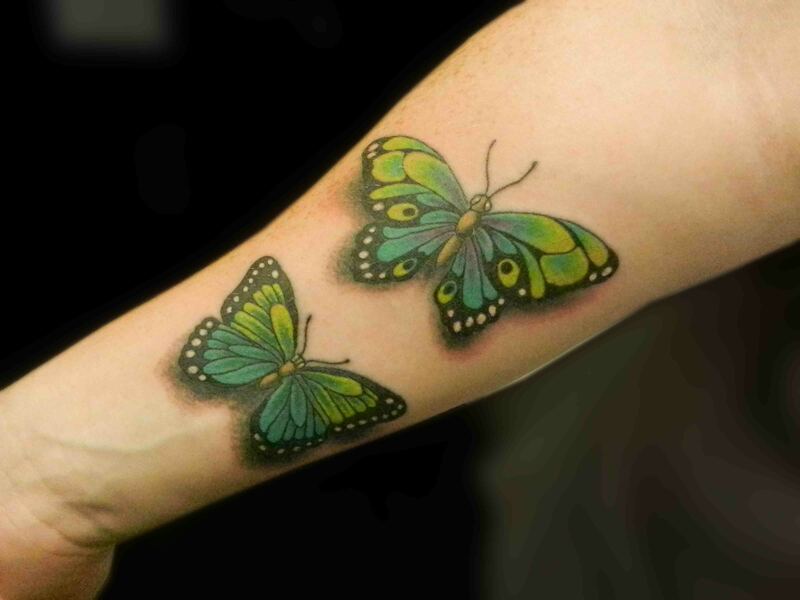 Whilst men will sometimes choose to place a butterfly within a tattoo design the butterfly remains prominently a female tattoo choice; is this because of the enormous variety, their delicate and detailed colouring or is there something else? For the ancient Aztecs the two noblest deaths was that of a fallen warrior and for women who died during childbirth, with the butterfly representing their souls. In Japan one butterfly would represent young womanhood and two butterflies for marital bliss (I have two butterflies). Japan’s Geisha’s have also long been associated with butterflies. According to Chinese culture, a butterfly stands for joy, happiness and wealth and is considered to be a sign of good luck. In Celtic symbolism the butterfly hold similar characteristics and represents beauty, love, honor, also being a symbol for the soul within the Celtic belief. In Ireland the butterfly is though of as the souls of the dead waiting to pass through purgatory. Whilst the legends of the Native Americans thought that the butterfly would carry wishes to the Great Spirit to be granted. And in Greece it thought that a new human soul is born every time that a butterfly emerges from its chrysalis. Over the years people have had a fear of butterflies along with their night-time relation, the moth, who was thought to be an omen of death, whilst the human soul took the form of the butterfly. 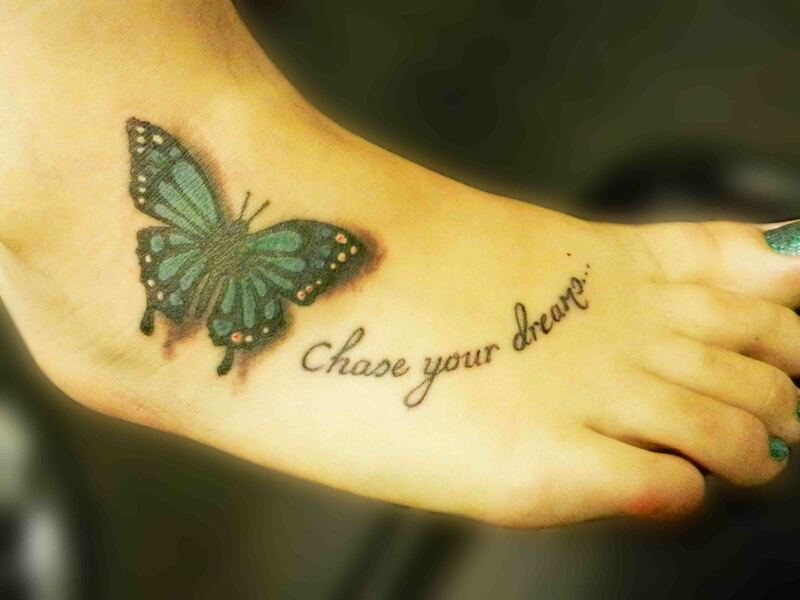 So does the positioning of your butterfly mean anything? Apparently so, it seems that there has been a trend for women to place their butterfly on one of the seven-chakra points (maybe unknowingly admittedly). We are not sure however, how many women would really choose the third-eye position (between the eyes) for a butterfly placement. The butterfly paced on the shoulder blade is said to represent the dreamer, the chest unconditional love for living things, the lower back symbolising stability and self-preservation. Below the belly the tattoo represented virginity (a long-standing tradition of branding maidens for the gods), but now thought of more as a representation of true love. However it doesn’t really matter if your butterfly tattoo is there to represent a transformation or metamorphosis in your life, moving through different life cycles, renewal or playfulness, or tuning towards your emotional or spiritual self or whether it there solely for its pure beauty and design. Celebrities with butterfly tattoos include Julia Roberts, Britney Spears, Drew Barrymore and Harry Styles to name but a few.